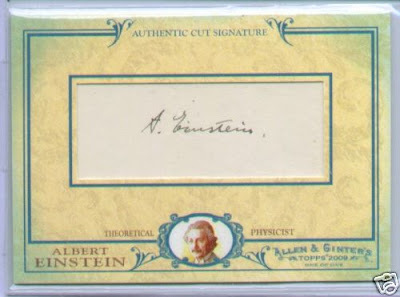 I love Topps Allen and Ginter and being a bit of a math and science geek (I was a part-time physics major in college and I work in IT...it's a good think I collect baseball cards to make me seem cool! ), I really love this card. 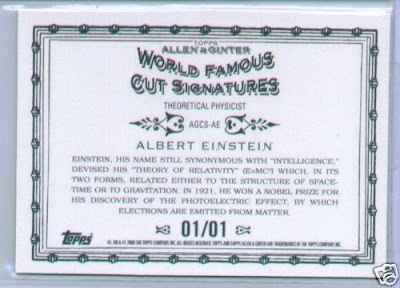 I have the 2009 A&G Einstein base card out on my desk just because I think it's a cool card. Thanks to the seller (lts_cards) for letting me use these scans. I will be very interested to see what this ends up at. Here is a link to the eBay auction and a couple of scans of the card. Wow, already at $1,000. I don't keep an eye on too many of the high end ebay auctions but it's always nice to have them brought to my attention. This is definitely an autograph I'd love to have in my collection. I can't even imagine the excitement of pulling something like this, can you? No, I can't imagine it either. I've pulled a couple of nice Heritage auto's of HOF'ers that I've sold for $200 or so each, but nothing like this.